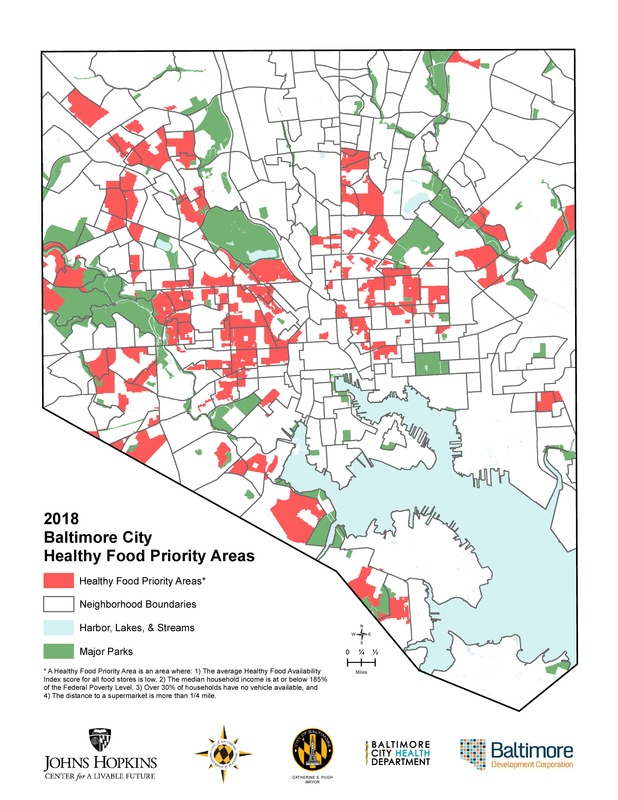 The Department of Planning and the Johns Hopkins Center for a Livable Future collaborate to examine the Baltimore food environment through research, analysis and mapping in order to inform the work of the City’s Baltimore Food Policy Initiative (BFPI). BFPI is a collaboration between the Department of Planning, Office of Sustainability, Baltimore City Health Department and Baltimore Development Corporation that draws on the expertise of each to use food as a lens to examine and address the systems that perpetuate food environment disparities. 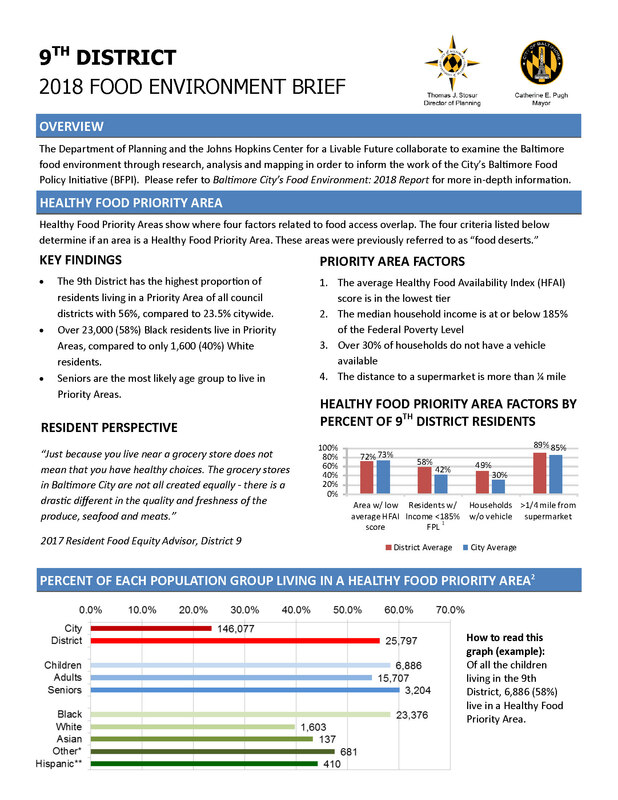 The city brief provides a snapshot of the impact of Healthy Food Priority Areas and an analysis of food retail, nutrition assistance, and urban agriculture from a citywide perspective. Another new development in the 2018 Food Environment Report is the creation of comprehensive briefings for each of the fourteen City Council Districts and six State Legislative Districts. This information will help policymakers understand what the food system looks like in their districts as well as citywide, and Resident Food Equity Advisors are available to support the efforts in their districts. 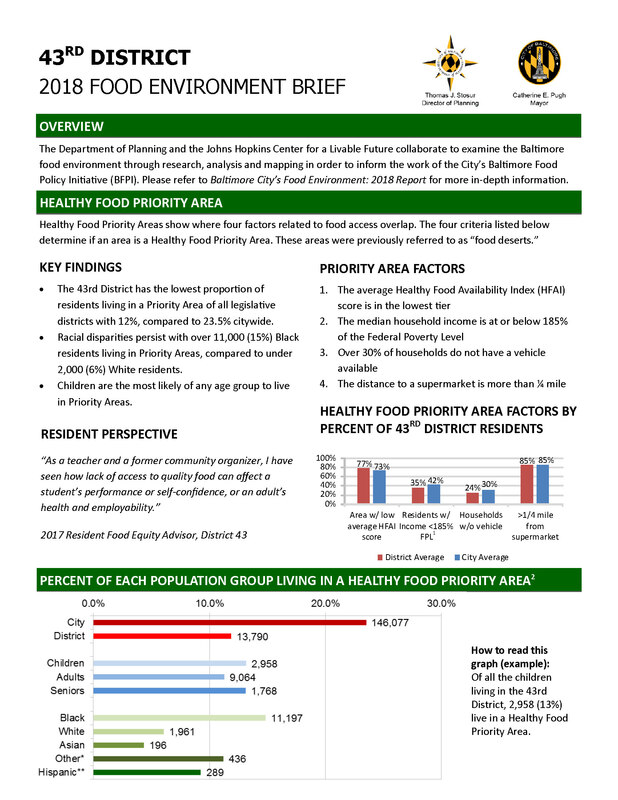 The data gathered in the report and briefs along with the input of Resident Food Equity Advisors drive the city’s comprehensive eight-point Healthy Food Environment Strategy. Conversations with Resident Food Equity Advisors and the Food Policy Action Coalition as well as community groups, residents and national leaders revealed that the term “food desert” is often met with critique or disapproval. “Food desert” suggests there is no food, when in actuality in urban environments there is an imbalance between healthy and unhealthy food. Additionally, the term puts the whole area in a liability framework and does not acknowledge the amazing grassroots work occurring on the ground to fill the gaps. As a result, the term “Food Deserts” has been changed to “Healthy Food Priority Areas.” While the frame has changed, the definition has not. The number of people living in Healthy Food Priority Areas has declined from 25% in 2015 to 23.5% in 2018. Since 2015, as a result of the Personal Property Tax Credit legislation that the city passed, at least 5,000 fewer residents live in Priority Areas on account of the opening of a new supermarket in East Baltimore. Certain groups of residents are affected at disproportional rates. 31% of Black residents live in Healthy Food Priority Areas, the highest of any racial or ethnic group. By comparison, only 9% of White residents live in Priority Areas. On average, children are the most likely of any age group to live in Priority Areas, at 28% of all of Baltimore’s children. 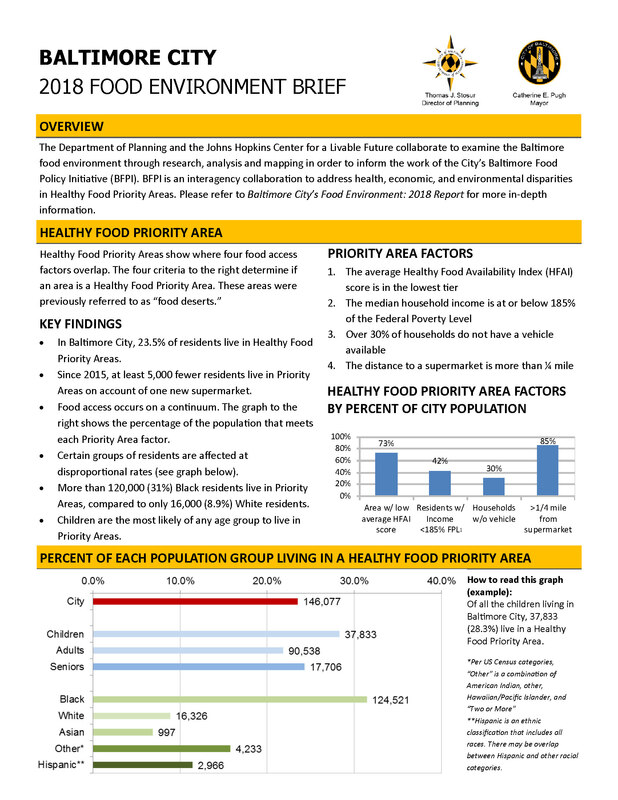 Seniors also live in Healthy Food Priority Areas at disproportionate rates, with 24% of all of Baltimore’s seniors. The Special Supplemental Nutrition Program for Women, Infants and Children (WIC) is a federal nutrition program for pregnant women and children that provides specific healthy foods. Stores that accept WIC have a wider variety of healthy staple foods, and a higher HFAI score. Analysis shows a 41% increase in HFAI score at small grocery and corner stores that accept WIC and SNAP compared to similar stores that do not accept nutrition benefits.